Rep. Ryan Says New GOP Budget Plan 'Offers Real Solutions Again' : The Two-Way Critics are already taking shots at the latest plan from House Republicans. With a video, an op-ed in The Wall Street Journal and press events today, House Budget Committee Chairman Paul Ryan, R-Wis., is offering what he and other Republicans say is a budget plan with "real solutions" to the exploding federal deficits and debt. "Our budget delivers real spending discipline. It does this not through indiscriminate cuts that endanger our military, but by ending the epidemic of crony politics and government overreach that has weakened confidence in the nation's institutions and its economy." NPR's Tamara Keith reports on Morning Edition that among the differences from last year's GOP blueprint, the new proposal would allow senior citizens in the future who are covered by Medicare to "choose between government coverage and private insurance." Last year, Ryan and his colleagues proposed turning Medicare into a voucher program. The National Journal adds that "in an attempt to rein in government spending and slash corporate tax rates, Ryan's budget aims to lower the corporate tax rate to 25 percent, from its current level of 35 percent. It also consolidates the six current tax brackets to just two: 10 percent and 25 percent, among other cuts and changes to the tax system. ... [It] aims to cut $5.3 trillion over the next 10 years — a drastic move that will see fervent pushback from his Democratic colleagues." Along with the video and op-ed, the Budget Committee is posting materials about the Ryan plan on its website. The Washington Post's The Fix blog reports that the plan is already coming under criticism from some other Republicans, who say it will be a political problem for the party. And critics from the Left are weighing in too. Roger Hickey of the Campaign for America's Future calls it a "suicide pact ... that ignores the clear views of the majority of Americans." The Budget Committee has now posted its new "Path to Prosperity" plan here. the "key facts and summary" begin here. 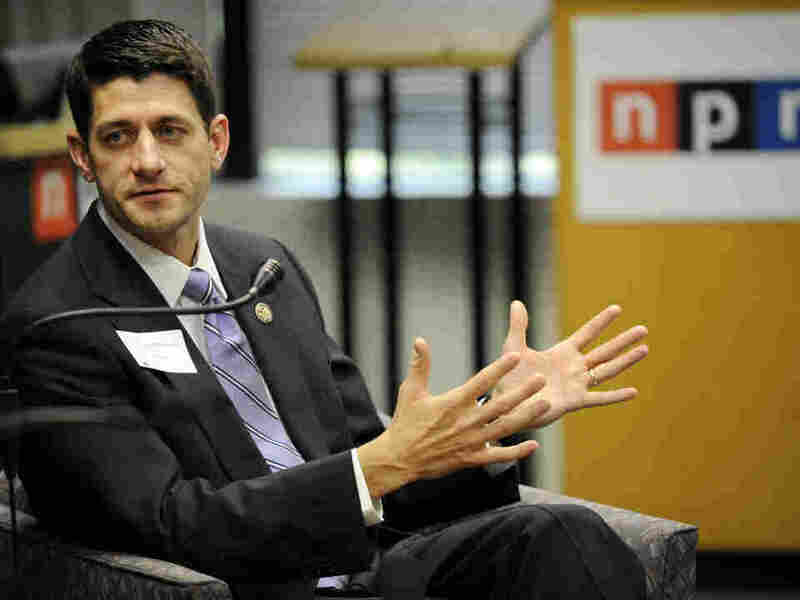 Rep. Paul Ryan, R-Wis., at NPR headquarters in May 2011.